cells in which SIRT1 protein has been removed (in red). Cell reprogramming converts specialised cells such as nerve cells or skin cells towards an embryonic stem cell state. 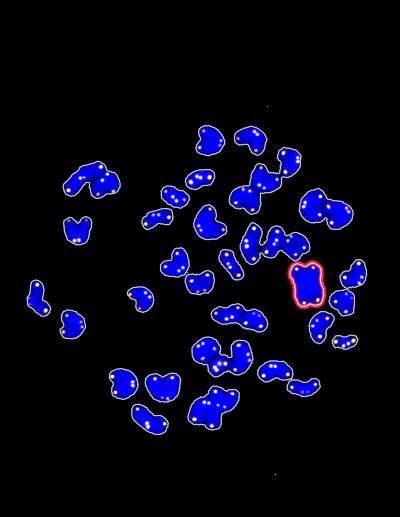 This reversal in the evolutionary development of cells also requires a reversal in the biology of telomeres, the structures that protect the ends of chromosomes; whilst under normal conditions telomeres shorten over time, during cell reprogramming they follow the opposite strategy and increase in length. A study published today in the journal Stem Cell Reports, from the Cell Publishing Group, reveals that the SIRT1 protein is needed to lengthen and maintain telomeres during cell reprogramming. SIRT1 also guarantees the integrity of the genome of stem cells that come out of the cell reprogramming process; these cells are known as iPS cells (induced Pluripotent Stem cells). The study has been carried out by the Spanish National Cancer Research Centre's Telomeres and Telomerase Group, in collaboration with the CNIO's Transgenic Mice Core Unit. Since the Japanese scientist Shinya Yamanaka first obtained iPS cells from adult tissue in 2006, regenerative medicine has become one of the most exciting and rapidly developing fields in biomedicine. There is a very ambitious aim, given the ability to differentiate iPS cells into any type of cell; this would allow for the regeneration of organs damaged by diseases such as Alzheimer, diabetes or cardiovascular diseases. The nature of iPS cells however is causing intense debate. The latest research shows that chromosome aberrations and DNA damage can accumulate in these cells. "The problem is that we don't know if these cells are really safe", said María Luigia De Bonis, a postdoctoral researcher of the Telomeres and Telomerase Group who has done a large part of the work. In 2009, the same CNIO laboratory discovered that telomeres increase in length during cell reprogramming (Marion et al., Cell Stem Cell, 2009); this increase is important as it allows stem cells to acquire the immortality that characterises them. One year later, it was demonstrated that the levels of SIRT1— a protein belonging to the sirtuin family and that is involved in the maintenance of telomeres, genomic stability and DNA damage response—are increased in embryonic stem cells. The question CNIO researchers asked was: is SIRT1 involved in cell reprogramming? Employing mouse models and cell cultures as research tools in which SIRT1 had been removed, the team has discovered that this protein is necessary for reprogramming to occur correctly and safely. "We observed cell reprogramming in the absence of SIRT1, but over time the produced iPS cells lengthen telomeres less efficiently and suffer from chromosome aberrations and DNA damage. SIRT1 helps iPS cells to remain healthy." said De Bonis. The authors describe how this protective effect on iPS cells is, in part, mediated by the cMYC regulator. SIRT1 slows the degradationof cMYC, which results in an increase in telomerase (the enzyme that increases telomere length) in cells. The study sheds light on how cell reprogramming guarantees the healthy functioning of stem cells. This knowledge will help to overcome barriers that come out of the use of iPS cells so they may be used in regenerative medicine. Note to spammers: You shall not pass. If you really want a link from us then consider making a stem cell related guest post ! Stem Cells Freak, your daily source for the latest stem cell news. Hosted by Blogger. The owner of this website, http://www.stemcellsfreak.com, is a participant in the Amazon Services LLC Associates Program, an affiliate advertising program designed to provide a means for sites to earn advertising fees by advertising and linking http://www.stemcellsfreak.com to Amazon properties including, but not limited to, amazon.com, endless.com, myhabit.com, smallparts.com, or amazonwireless.com.